The A380 is a double-decked passenger airliner manufactured by the European corporation Airbus. The Airbus A-380 made its maiden flight in April 2005 and its first commercial flight in October 2007 from Singapore to Sydney, Australia. In the most common seating configuration, the A380 passenger capacity is about 525 people. The A-380 has a range of about 8200 nm which makes possible a New York to Hong Kong non-stop flight. The A380 jet cruising speed is about 560 mph. Follow the world's largest airliner from its birthplace in Toulouse to the first public appearance at the world famous Paris Air Show and beyond. Go from the First ever Asia tour and First Air bus A380 flights into Singapore, Sydney, Kuala Lumpur and Frankfurt to the many important testing processes! See the Airbus A380 MSN 004 in Dubai for the Dubai Air Show and at Asia's largest Air Show - Asian Aerospace. Experience A380 flights including the FIRST EVER arrival in North America for cold weather testing at -45 degrees, the heat of the Dubai desert and the high altitudes of the first ever arrival in South America at Medellin, Colombia! Witness the amazing aerial displays and the testing processes! Join an Exclusive VIP Tour as it explores the Airbus a380 interior! Witness aviation history as it unfolds! 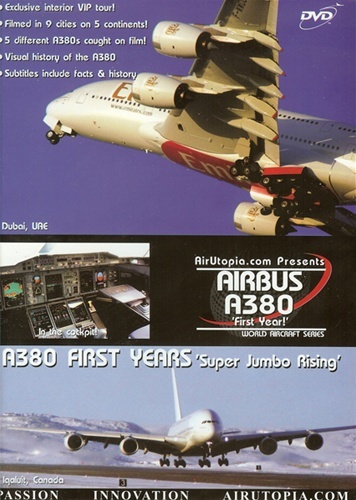 Experience this worldwide A380 adventure FOR THE FIRST TIME ON DVD by AirUtopia, the company that has followed the newest Super jumbo to the corners of the world! Filmed on 5 continents and 9 cities! These A380 videos have a run time of about 120 minutes. The format of this A380 video is NTSC DVD and region-free.